We are at your service throughout the whole process, starting from choosing the right type and material of seals or gaskets, until the installation and changing. We are offering different seals such as shaft seals, roll-mill shaft seals, V-rings and gamma rings, O-rings and backup rings as well as many hydraulic seals. Also our range of offered gaskets is wide, starting from different materials that can be cut into measurements of your needs. In our cutting-shop located in Finland, they use CAD-technology which assures top quality of cut gaskets. Big warehouse allows us to deliver orders quickly. Our biggest clients are active in oil, wood and power industry, also in machinery industry. In cutting-workshop gaskets are cut quickly and according given dimensions. Our cutting workshop has both – mechanical cutters and automated cutting systems. Computer controlled cutting-machine ensures that each cutting has the highest quality. Full service warehouse, oriented to customer needs, ensures reliable delivery anywhere in the world. We have well-equipped warehouse, to ensure fast delivery times. Engineering service enables to design, in computer, new gasket according to your old gasket dimensions and send it directly to workshop cutting bench. This saves time and effort, and you can be sure that new gaskets are perfect for your appliance. KLINGERexpert® is versatile software solution that helps user to select proper gasketing matrials. This software integrates centuries of KLINGER experience about the seals and makes it more user-friendly. KLINGERexpert® is now also available as a mobile app for iPhone and iPad and Android. Minimising work stoppages in the industry are with critical importance, because unplanned stoppages cause huge losses to the company. During tests, in industrial conditions, quality of our seals has been proved to be more durable from competing products and require less frequent replacements. Chemical industry puts seals resistance on a serious test. Different solutions, acids and bases wear seals out properly. We have high quality and durable solutions for no matter how demanding conditions are. Pulp and paper industry involves a number of stages in production and chemical processes, which require the specific features of the gaskets. Seals have to withstand harsh industrial conditions are caused by corrosive liquids was well as high rotational speeds. We offer right solutions for all stages of the production process. High pressures and temperatures are everyday occurrence in power plants, and will also seriously test the seals. KLINGER semi-metal and graphite seals are able to meet this challenge. Our seals have longer life span from competing products, giving seals longer change interval. When it comes to food, it is necessary to guarantee that harmful substances don’t fall into production process. Our range includes the FDA (USA Food and Drug Safety Agency) approved seals, that are suitable for the use in food and beverage industry. Oil and gas production and processing systems air tightness is not only a goal, but a requirement! Our gaskets allow enhancement of production processes and also follow with environmental, safety and other regulatory requirements. With infrastructure, it’s important that all processes run smoothly and securely. 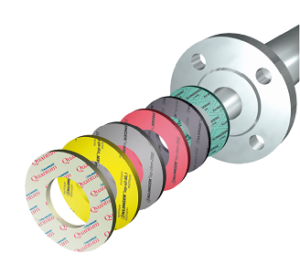 Our high quality seals meet fully with the needs in long-term processes. Our range encompasses solutions for both drinking water and wastewater treatment systems. KLINGER gaskets are suitable for use in automotive industry, shipbuilding industry as well as in air transport, responding to mentioned areas with quality and safety standards. KLINGER gaskets may be found even in outer space!